There is hardly anything that heralds the triumphant return of spring than the morel. This fungus is held in the highest regard by chefs and diners the world over. Graceful, intricate, strong, and timid I oft make the assertion that it is the Queen of fungi to porcinis status of King. Morel Mania afflicts many an individual each spring; the thrill of the hunt is just as exciting as finding them. This mania is so strong in some individuals that morels have achieved a cult like devotion of individuals. I myself have a hopeless case of Morel Mania and have given my daughter Morchella as one of her middle names. 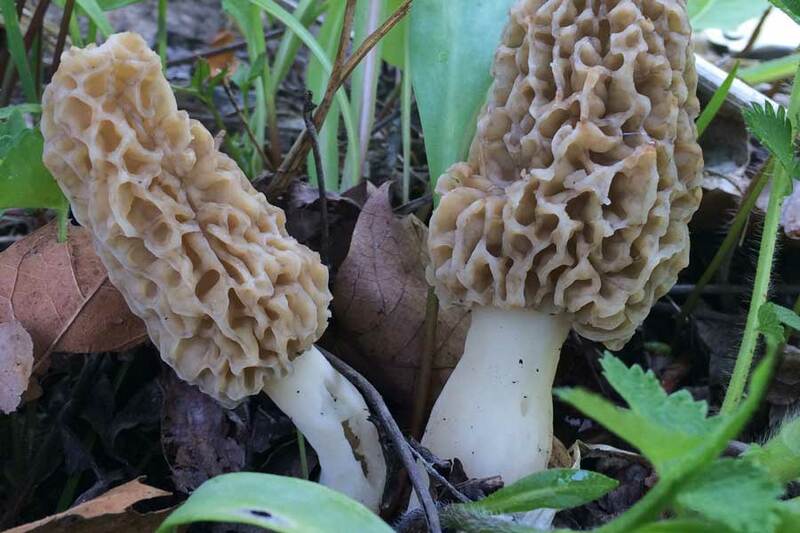 For many years mycologists and morel hunters have tried to develop a laundry list of rules to follow in order to help people, and themselves, more easily locate morels. Let it be said that, just like all other fungi, fungi love to break the rules we make for them. Only one rule is helpful: walk slowly and look for a long time. Morels are mychorrizal and, possibly, parasitic & saprobic. Depending on where you live they can be found under various hardwoods such as Elm, Hickory, Ash, Tulip, and Cottonwood. The cap can be various shades of yellow, brown, grey, and black often several shades at once. It is usually cone shaped and covered in randomly arraigned ridges and pits. The pits are the spore bearing surface. The spores can be various shades of white, cream, or yellow depending on the exact species. The stipe typically will be fused to the cap, be white, sometimes smooth but most likely have a granular texture and appearance, and have a swollen, bulbous base. Morels will be hollow inside from the tip of the cap to the base of the stem; this is really important to note seeing that the poisonous Gyromitra spp., the False Morel, only has a hollow stem. Depending on where you live and your local weather patterns morels can be found as early as the first of April and as late as the end of May. This further fuels Morel Mania seeing that the season is extremely short compared to most other edible fungi.